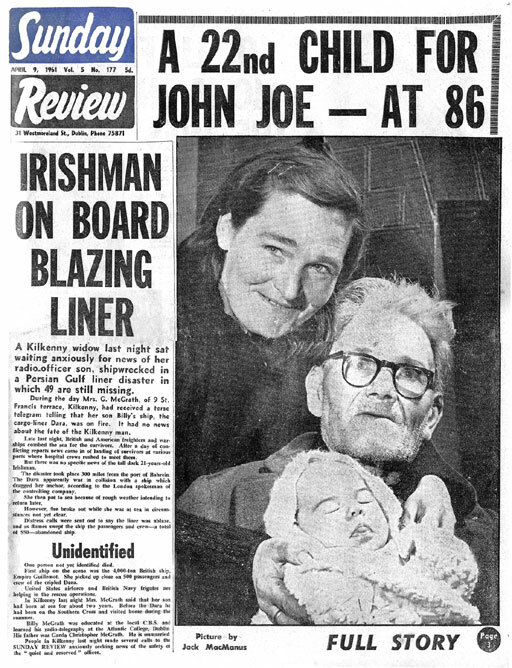 This long defunct weekly Irish Sunday tabloid newspaper was printed and published by the Irish Times in Westmoreland St, Dublin. Wikipedia simply states that the paper ran from 1957 to 1963. My mother remembers it and says it was quite popular. Anyone else with more info on this paper? 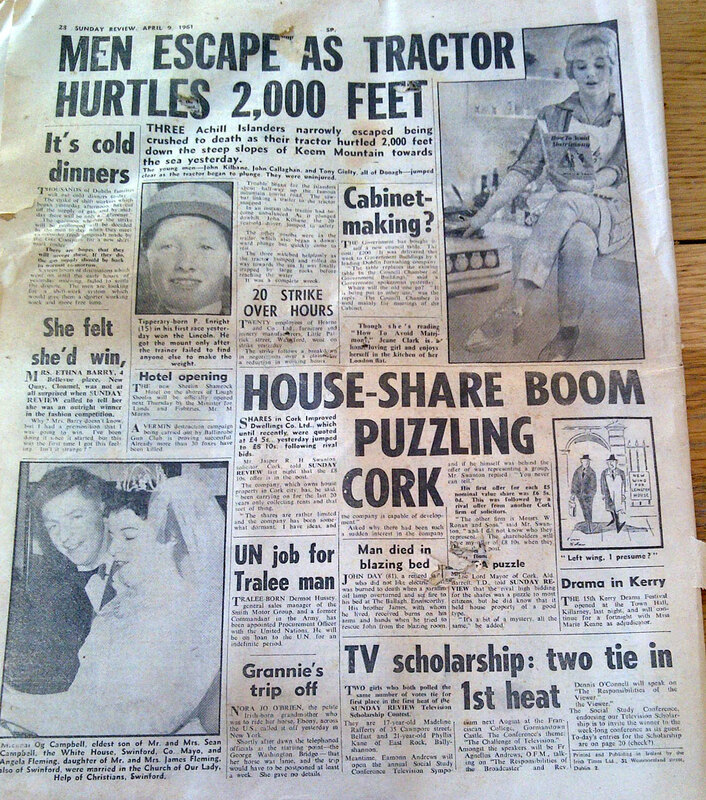 I’ve scanned in the front cover and the main story about an 86 year old Sligo man who recently became a father for the 22nd time. The Cadbury’s Irish Rose advert below is a also a scan but the other pages are just photos to give an idea of the paper’s content. (Rovers losing to Shels!) 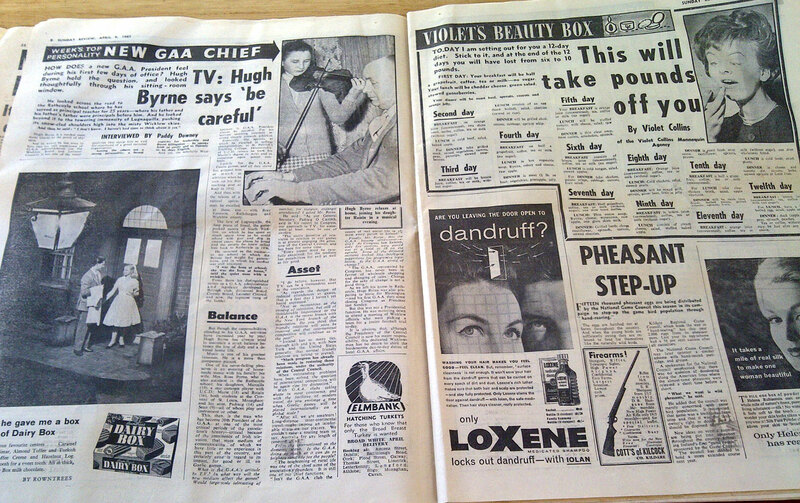 And of coure, there was our post on the TV Competition from earlier this week which was taken from this same issue. “So much to enjoy, so gay, so good” – HA! Brilliant!! 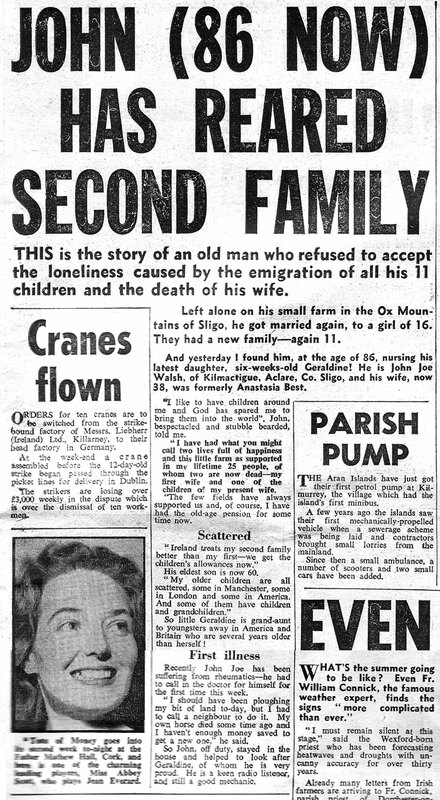 2 years after siring his 22nd child at the age of 86 – as referenced above – JJ realised another childhood dream by having his first ride in the Epsom Derby aboard the appropriately titled Afro Dizzy Jack, finishing a respectable 13th of 22 runners…”I’m gutted”, he exclaimed, when doorstepped by Derek Thompson on his way into the unsaddling enclosure,..”if we had Lottery funding to build an all-weather gallop we’d have won the f***ing thing”, no doubt an allusion to the difficulties of preparing a highly strung thoroughbred colt on the tarmaced boreen that leads to his small holding, halfway up a mountain in the wilds of Co Sligo. Inspired by this venture, he pulled off another coup by entering and winning the 1990 Miss Ireland Contest amid mass confusion due to its being held at exactly the same time as that famous penalty-shoot out between Ireland and Romania at the World Cup. At Miss World proper, which was held in Baghdad that year as the first bombs rained down in the Gulf War, it appeared that John Joe was on the verge of pulling off a sensational upset as his full body-length Burka won him the entire Middle East and Arab vote, and he shared the laurels in a 4 way tie. As he made his way back to the stage for the Penalty Swimsuit Shoot-Out to decide the outright winner, he was pulled aside, escorted to the exit and dispatched into the full exposure of the aerial bombardment – not for any gender issues, we understand, but apparently because some pedant had alerted the judges to the fact of him being a mother (as well as father to 22)…” f***ing begrudgers and sodomites” he roared at their backs while doing his best to avoid an oncoming Scud missile. Can you get the 1970’s advert for Jacob’s Windmill biscuits online soon many older Irish adverts are gradually becoming hits again that to their appearance on the Irish Film Archive website as you know Galtee Meats are now 50 years old. 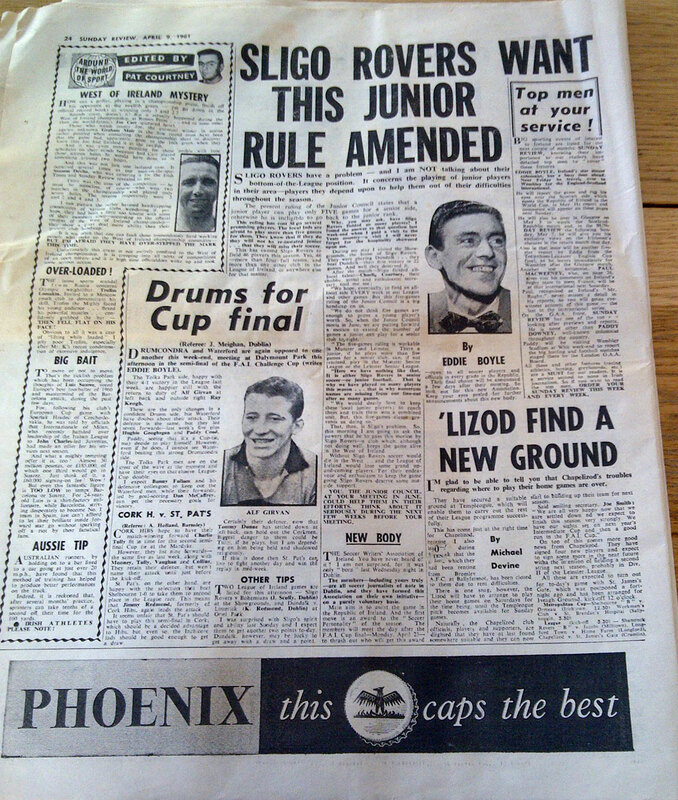 It was my father the late Ted Nealon of the same parish who wrote this story. He was news editor of the Sunday Review at the time. Apparently John Joe took a dislike to Ted after his new found fame presuming he had made a fortune of it! 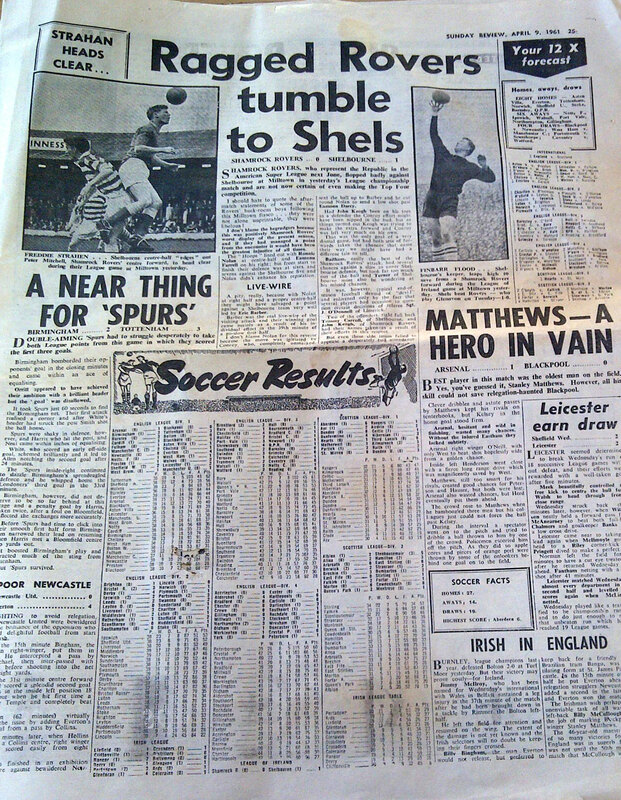 The Review was the Irish Times early effort at a tabloid Sunday paper. It is where Ted and John Healy created the famous “Backbencher” political column which ended the bland and docile political reporting which preceded it. It was an extremely influential political column and went on to have a huge readership when Healy transferred it to The Irish Times after the review closed. 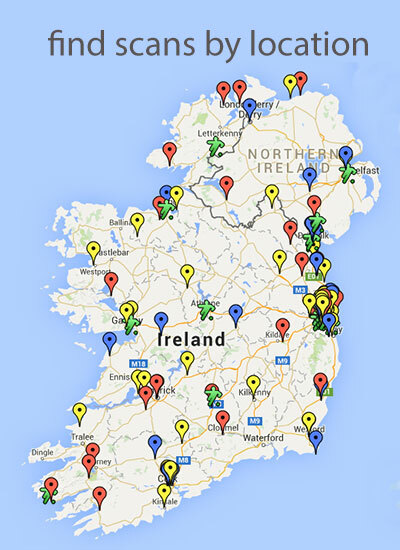 That’s fantastic Fergal – thanks for sharing. This was the first issue of the Sunday Review that I came across. I’ve picked up a few others since. I asked my Mother did she remember the newspaper. She did, and indeed she even recalled the story on John Joe from 1961.